Total: 4 hr 5 Min. | Active: 35 Min. Whether you have it as a snack between meals, a breakfast or a light dessert, this pudding won't disappoint! The mango cream is so refreshing and fruity that even the fullest of stomachs won't be able to resist. In addition to lots of antioxidants, minerals and vitamins, chia seeds are high in Omega 3 fatty acids and full of protein. The combination of the jelly-like chia pudding and slightly chilled yet smooth mango cream speaks for itself! As with virtually all of my recipes, you can be as creative as you like with the toppings. I can highly recommend berries, pomegranate seeds and toasted coconut flakes. I don't normally give instructions on how food should be eaten, however in this instance it's important you first dip your spoon right down to the bottom of the glass. This means that you'll get a little bit of everything on your spoon and can savour all the different flavours! Combine the chia seeds, almond milk, vanilla paste and maple syrup in a bowl, mix well. Leave to absorb for approx. 2 hrs. or overnight. Stir well before serving and add 50-100 ml of cold water depending on the consistency. Freeze the mango pieces for 1-2 hrs. (this guarantees a cold and creamy consistency). Place the frozen mango pieces, ice cubes, matcha powder, vanilla paste and a shot of almond milk into a blending cup, puree until smooth and creamy. Place the coconut flakes, maple syrup and salt in a pan and toast until golden brown. Leave to cool. 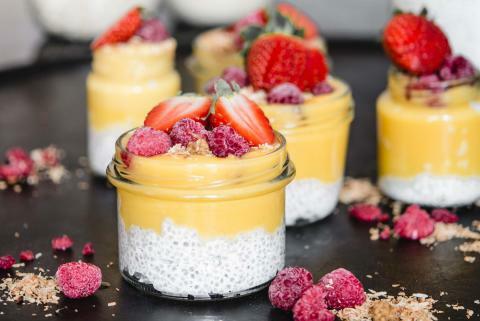 Divide the chia pudding between four glasses, top with the mango cream and decorate with the toasted coconut flakes and berries. You can also use another milk of your choice, however almond milk is what makes the chia pudding wonderfully creamy and white. Make sure you buy a ripe Primagusto mango (Coop) to improve the quality and sweetness of the mango cream. Believe me, the extra 2 francs are worth it! If you can't find one, then mix 1 tbsp of maple syrup into the mango cream.